Stroke is the third largest cause of death, and the leading cause of serious, long-term disability in the United States. Stroke is a form of cardiovascular disease, affecting blood flow to and within the brain. 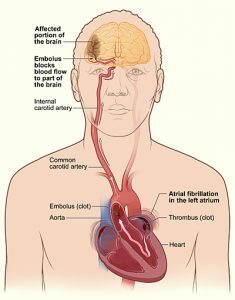 A stroke occurs when a blood vessel that carries oxygen and nutrients to the brain either bursts or is blocked. This causes areas of the brain, which are not receiving oxygen through blood, to die or become dormant. When areas of the brain die from a stroke, the area of the body corresponding to the affected damaged areas of the brain becomes dysfunctional. Medical studies have found that while the prominent brain tissue of stroke patients may be damaged irreversibly, surrounding tissue that is considered dormant may be restored with hyperbaric oxygen therapy. It is these surrounding sleeping areas (the ischemic penumbra) that are responsible for the majority of the disability present in stroke. Reviving these inactive areas with oxygen has resulted in a return of functionality and in some cases, dramatic recovery. Swelling of tissues, resulting in lack of blood flow and oxygen, often accompany the death of cells in brain tissues in stroke patients. 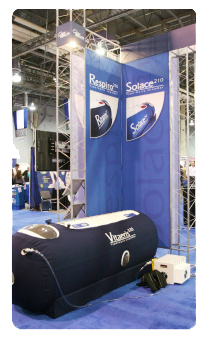 Hyperbaric pressurizes the environment to allow oxygen to better penetrate parts of the body where blood flow is hindered. Hyperbaric oxygen therapy alleviates ischemia and hypoxia, which are defined as lack of blood flow and oxygen. In addition, the therapy decreases swelling of chronically traumatized areas of the brain as well as other swollen tissues. Oxygen is dissolved in the plasma and nourishes tissues, regardless of the absence of red blood cells, when hyperbaric oxygen therapy is utilized. The pressurized chamber forces oxygen into all areas of the body, resulting in a re-awakening of dormant areas of the brain prevalent in persons who have suffered a stroke. Hyperbaric therapy is also known to regenerate new blood vessels to damaged areas of the brain and aids in the repair and restoration of glial cells, extracellular matrix and injured neurons.